Whether you have worn eyeglasses for years, or you’re shopping for your first pair, finding the right frames can be challenging. 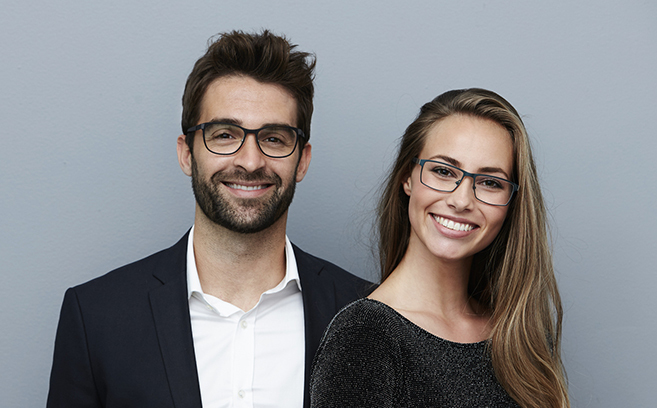 A lot of factors play into matching your vision needs, style and life with frames that will provide great quality and value. The general shape of your face greatly influences the frames that may be right for you. Rectangular frames are generally preferred for rounder faces, as they help to lengthen the face. Squarer faces often look best with circular or oval frames. People with oval faces can generally wear any frame shape. Some people prefer thicker, fuller frames. Others like minimal frames. Full rim glasses help to focus attention on the eyes. Semi-rimless frames accentuate the upper portion of your face. Rimless frames produce the least impact on the appearance, while deemphasizing the forehead. Choose the frame type that accents your best features. Think about the activities you will likely participate in while wearing your glasses. If you have an active lifestyle, flexible frames may enhance comfort and durability. If you use your glasses to read intermittently throughout the day, consider a pair that separate in the middle and then hang around your neck. Your optician will talk you through several lifestyle-related options. Today’s eyeglass frames come in a rainbow of colors. Most people agree that warmer complexions look best with frame hues you might see in a fire: reds, coppers, golds, oranges, creams, corals, khakis and beiges. Cooler complexions look great with icy and steely tones: blues, grays, slivers, plums and roses. Of course, it all comes down to personal preference, so have fun discovering the best color for you. More than anything else you wear or own, your eyeglasses are the most common things people see on you. With so many styles to choose from, you are sure to find a pair that conveys something about the way you perceive yourself and how you want others to perceive you. From classic to modern and conservative to flashy, the right frames speak volumes about your personality. The best way to find the right frames for you is to head in to your area’s best optical shop. North Florida Cataract Specialists and Vision Care has two convenient optical locations – Tioga Town Center and our brand new Gainesville location on the corner of NW 8th Avenue and NW 43rd Street. Both shops feature hundreds of styles and colors from which to choose. And our expert staff with gladly answer questions and help you find frames that match your style and budget.